In keeping with the tradition of fine Wisconsin craftsmanship and tradition, Ellsworth Cooperative Creamery brings you Kammerude Gouda. Inspired by the work of retired Wisconsin dairyman-turned-artist, Lavern Kammerude, each flavor and label of the Kammerude line proudly bears the artist’s name and work. Lavern, of Blanchardville, Wisconsin, began painting later in his life. With no formal training, and painting entirely from memory, he captures everyday life in rural America circa 1910-1945. The neighbor’s threshing bees, the machinery of the day, and hauling milk to the cheese factory on cold winter days, are only a few of the childhood memories that come to life through his work. Fresh, simplistic, yet authentically detailed, the Kammerude name and imagery is a perfect complement to our Gouda cheeses. 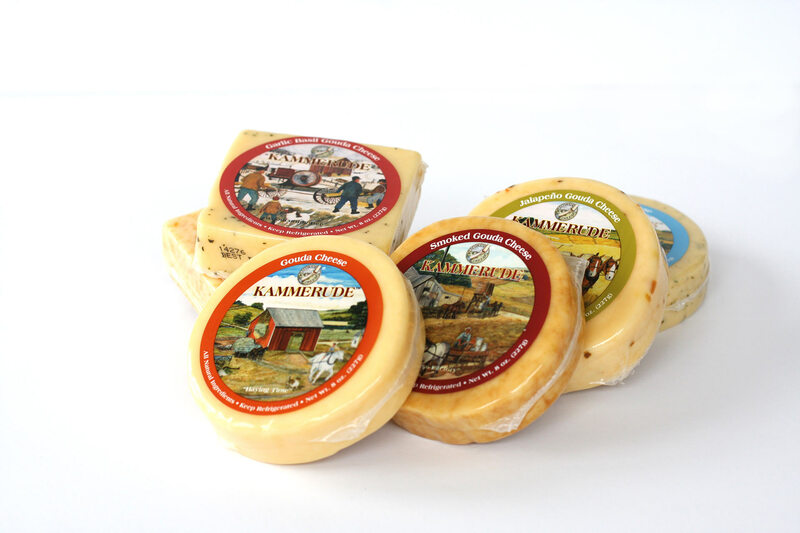 Our Kammerude Goudas offer a quality cheese, delicious flavors and an attractive package certain to stand out in any deli bunker or dairy case. Produced from whole cow’s milk, these semi-soft cheeses are similar to Edam. They have a firm, slightly yellow body scattered with a few small irregular holes. From traditional plain or smoked Gouda to our specialty flavored Goudas— we combine the highest quality ingredients with over 65 years of cheese making experience to produce these delicious natural cheeses. Cultured Milk, Salt, Enzymes, Annatto (color).